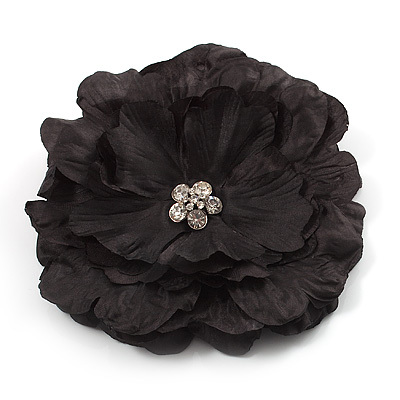 Complete your look with this fab Large Black Crystal Fabric Rose Brooch. Featuring a large dimensional rose brooch, made of jet black silk and decorated with round cut clear crystals at the centre for a dash of sparkle. The rose measures about 13cm in diameter and secures with a silver tone flag pin and revolver clasp. You can also wear this pretty fabric brooch on your favourite bandanna, hair bun or hat.